National Reference Laboratory (NRL) provides a wide range of occupational health testing services to diverse organizations including, corporate medical centers, visa screening centers and companies from different industries such as aviation, construction, oil and gas, and hospitality. NRL provides testing for a wide range of drugs and their metabolites with specimen validity testing (adulterants), including testing for the following adulterants: Creatinine, Nitrite, Glutaraldehyde, pH, Specific Gravity and Oxidants. Together with its partner Laboratory Corporation of America (LabCorp), NRL offers a variety of drug testing options which include urine, oral fluid, hair and blood. Laboratory results are sent to the employers within 24-48 hours. If needed, NRL can provide on-site sample collection services. For employers that require rapid drug test results, NRL offers on-site drug testing services done by experienced and trained sample collectors. For the required confirmatory testing of non-negative results from drug screening tests, NRL sends the samples to our partner LabCorp in the USA. Confirmatory drug test results are typically released in 7-10 calendar days. NRL is one of only four laboratory providers in the UAE approved by the General Civil Aviation Authority (GCAA) to carry out drug and alcohol testing for the UAE aviation industry. Studies have shown that an effective wellness programs of the employees leads to increase productivity, higher job satisfaction, reduced absenteeism and increase in employers’ morale. NRL offers a wide range of customized diagnostic and preventive test panels to meet the needs of your workforce demographics and supports your onsite company-sponsored health events. Monitoring of the exposure of your employees to hazardous substances is a vital step to minimize their health risks in the workplace. Together with the specialized laboratories of LabCorp, NRL can provide testing and customized test panels specific to your industry and workplace. This includes comprehensive blood and urine testing to monitor employees exposure to toxic metals and chemicals, including lead, mercury, arsenic, and cadmium, as well as benzene, toluene, Polychlorinated Biphenyls (PCB), halogenated hydrocarbons, and chlorinated pesticides. National Reference Laboratory offers testing for the UAE mandatory visa screening and has a proven track record in providing high volume testing services by being an exclusive testing partner to Capital Health Screening Centre (CHSC) in Abu Dhabi. NRL is able to process high volume of samples with a rapid turnaround time owing to our fully- automated laboratory system and the advanced connectivity solutions that allow interfacing with the information system of the client facility. 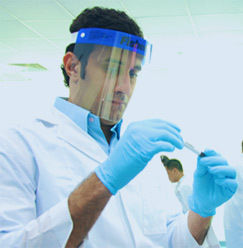 NRL is currently the largest College of American Pathologists (CAP) accredited laboratory network in the Middle East, with nine CAP-accredited laboratories. NRL has also attained ISO 15189 accreditations for six of the laboratories and has JCI accreditations for the hospital-based laboratories. NRL is also licensed by the General Civil Aviation Authority (GCAA) to carry out drug and alcohol testing for pilots, cabin crew, ground staff, air traffic controllers and other safety-sensitive avaiation roles in the UAE. The Quality Management System (QMS) of NRL is designed to provide the basis of quality processes, guidelines and laboratory workflows to ensure the delivery of quality testing services, accurate patient results, patient care, client satisfaction, and clinical outcomes. NRL follows rigorous International Standards of Chain of Custody procedures, documenting the management and storage of specimens from the moment a donor provides the specimen, right to reporting of the final test result, maintaining control and accountability of samples. NRL is the first fully automated referral laboratory in the UAE, enabling NRL to deliver high-quality patient results in the shortest time possible. The Total Laboratory Automation (TLA) solution, installed in the core lab of NRL at ICAD in Abu Dhabi, covers all phases of the testing process: pre-analytics, analytics, and post-analytics. NRL operates a state-of-the-art fleet of radio-dispatched, GPS-monitored courier vehicles. 0Samples are picked up from clients, logged by couriers and placed in temperature-controlled containers appropriate for the specific testing requirements. This is to guarantee the integrity of the sample during transport, which is critical in our warm climate. NRL is the first standalone laboratory in the region to apply the advanced Cerner Laboratory Information System (LIS) as the backbone of our automation and expansion capabilities. NRL has implemented a customized web-portal to provide clients with an online solution for tests ordering and results reporting. For organizations that do not have in-house capabilities, NRL provides specimen collection (phlebotomy) services at the company’s site. NRL offers secure, rapid and convenient services from highly trained sample collectors. NRL provides access to highly specialized testing service through our partner LabCorp. Clients will have access to over 4700 tests which include highly specialized tests in molecular genetics, molecular oncology, cytogenetics, oncology, biochemical genetics etc. Direct access to NRL expert in-country certified medical and technical staff dedicated to quality and international best practice procedures and quality control measures in each phase of service delivery.